These oversize chicken eggs were made for a theatrical production. 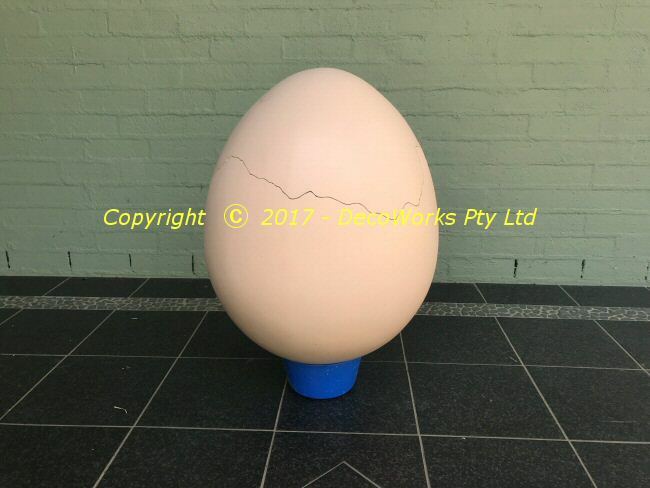 The oversize eggs are 60cm high and made from fibreglass for strength so they can be sat on. The first step was carving a polystyrene oversize egg so a fibreglass mould could be made. 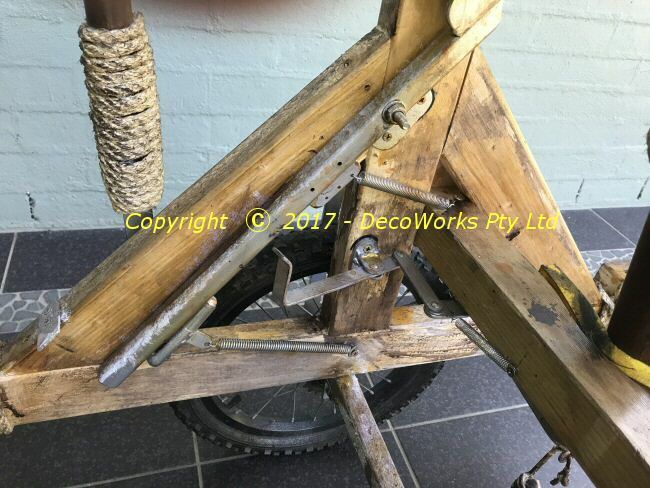 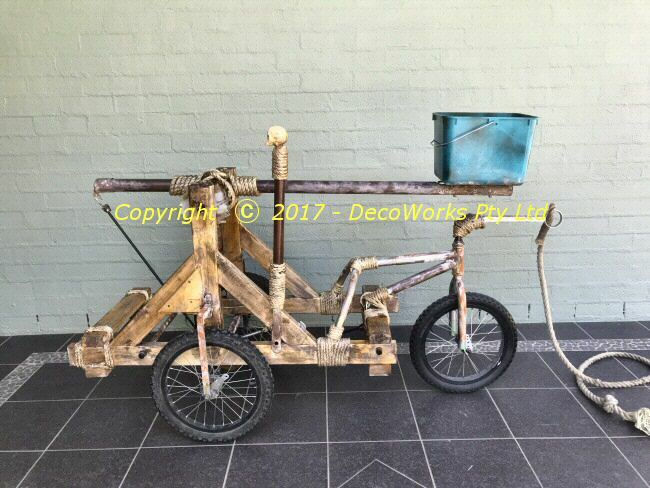 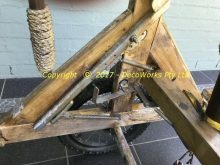 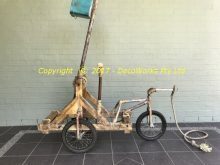 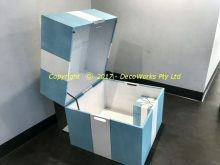 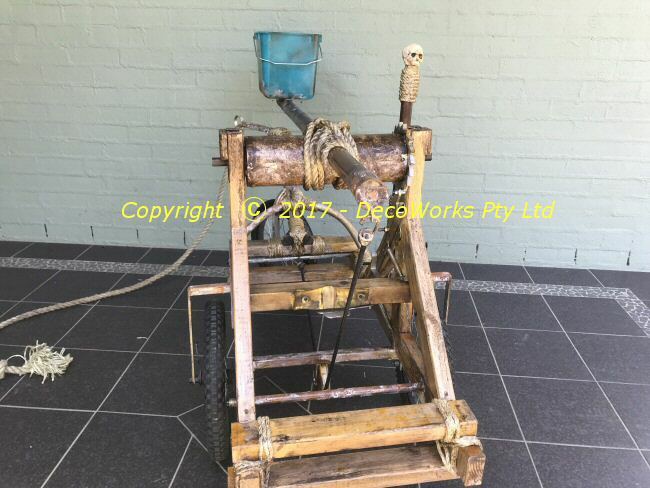 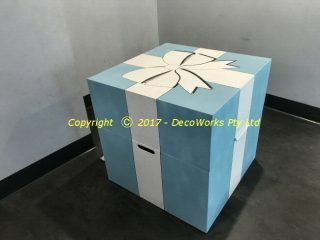 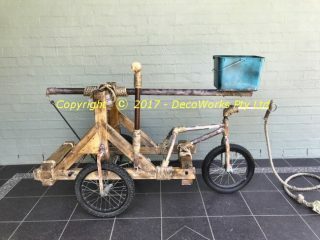 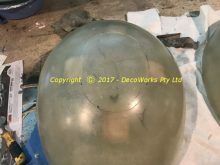 The mould construction is described in another post. 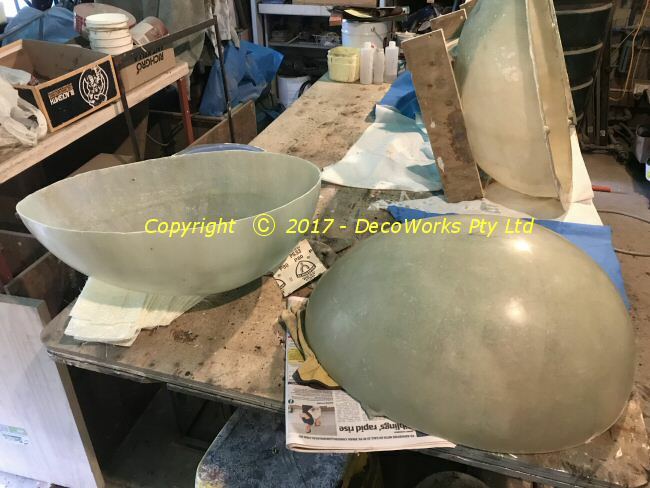 After the mould was finished two oversize eggs were cast. 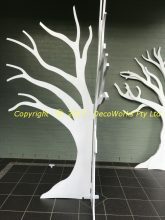 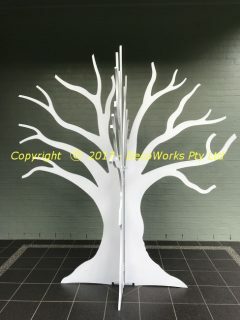 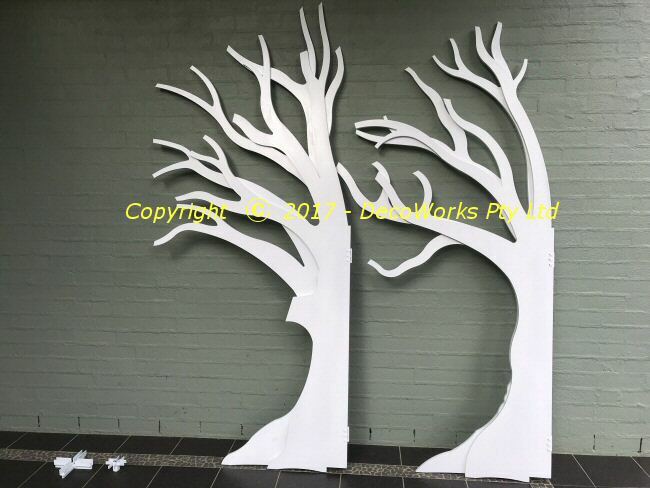 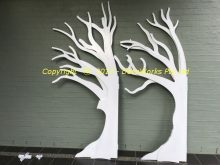 After the fibreglass halves were joined together they were painted. 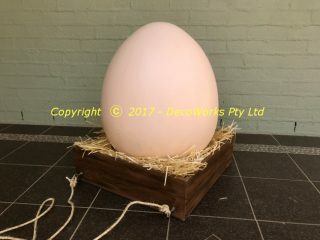 One of the oversize eggs was made with a broken top so something could *hatch* from it on stage. 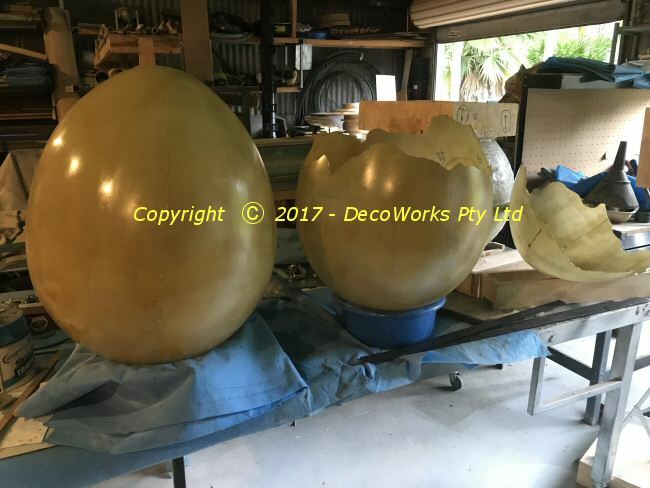 The first step in making a giant egg is to make a giant egg – so a mould can be made. 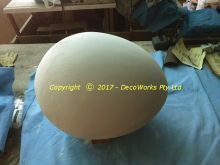 Depending on the size of the egg you want to make will dictate how you go about making the egg form. 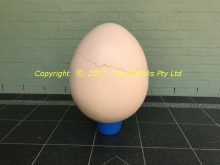 Since the egg we needed to make was about 60cm tall it was decided to carve it from a block of polystyrene. Since the egg shape is symmetrical it is best to turn it on a lathe. 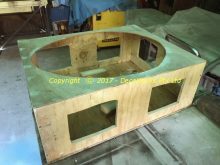 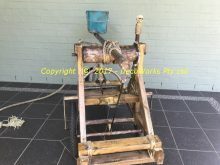 The polystyrene has to have plywood boards glued to both ends so a lathe faceplate and tailstock centre can be attached so it can be turned on the lathe. 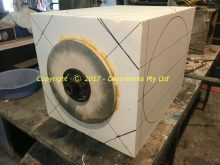 The corners of the block are then cut off at 45 degrees to make turning a bit easier on the polystyrene. 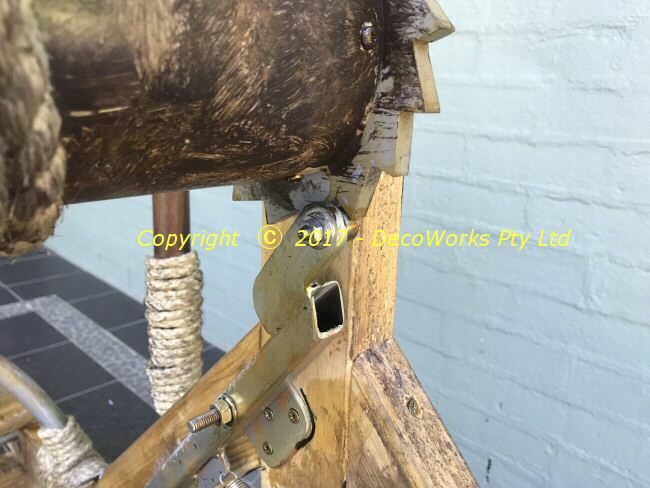 If this is not done it is likely large chunks will break off when the lathe chisel is applied to the turning block. 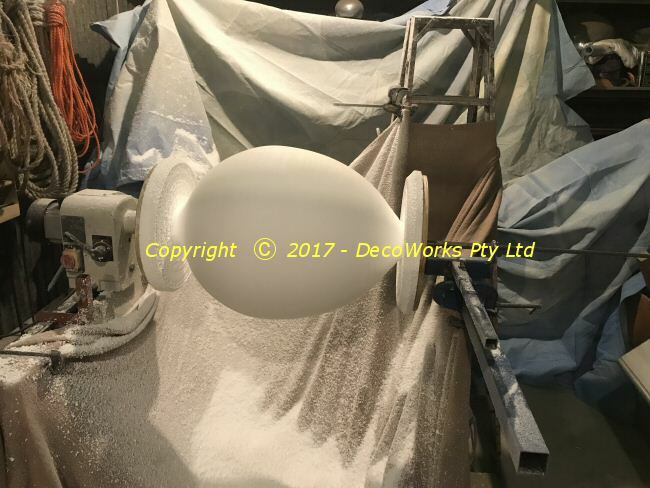 It is very, very messy turning polystyrene on a lathe so ensure the work area is covered with something to collect the shavings and clean up regularly as you work. 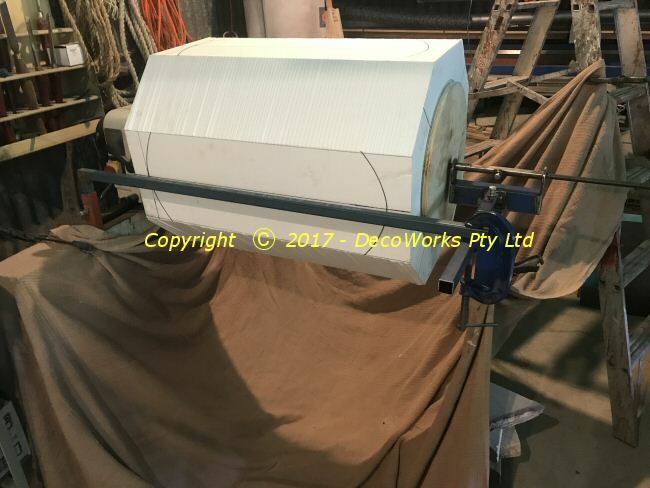 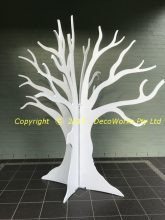 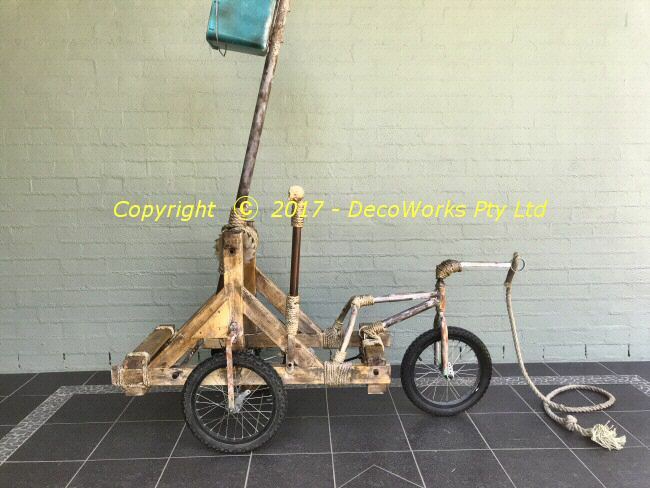 This will minimise the polystyrene getting into every nook and cranny of your workshop. The polystyrene is removed from the lathe and the two ends trimmed. Sandpaper is used to smooth both ends until their radius makes a smooth transition around the egg shape. It is important to get the shape exactly right with no obvious flat spots or sudden changes in the radius. 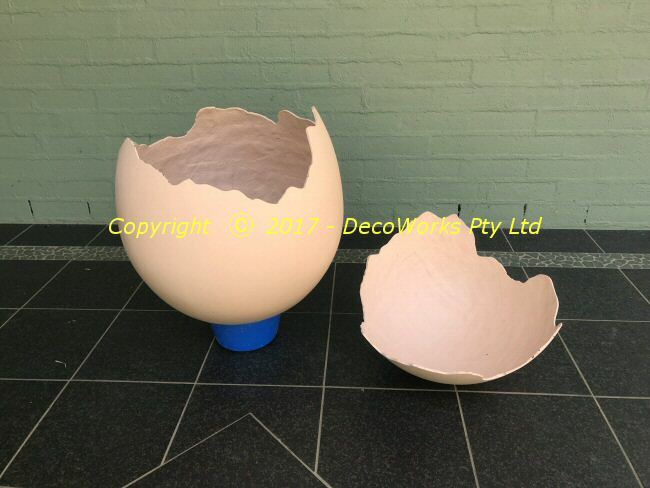 To support the egg while making the mould a box was built to put the egg form into so the middle flange can be made with plasticine. Once that has been done it is given a coat of PVA mould release in preparation for fibreglassing. Ply box for making the top half of the mould. 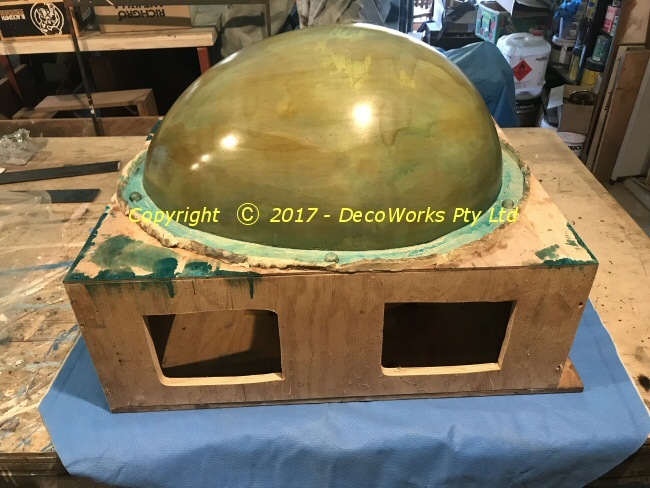 After the top half has been fibreglassed a timber support is fibreglassed on the mould so it sits horizontal when put on its side. 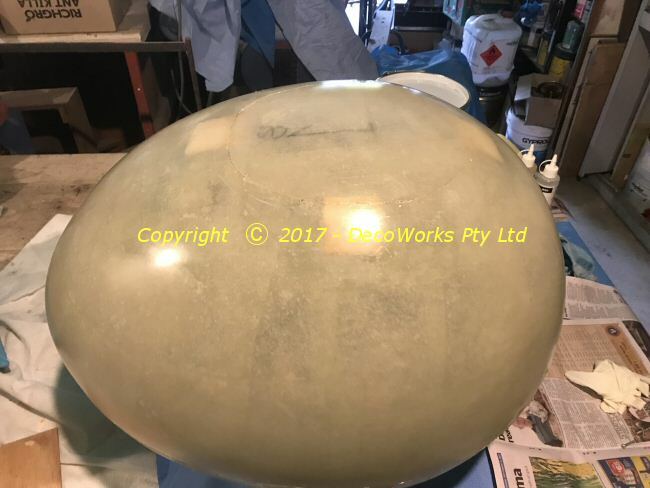 The egg with the first half of the mould attached is removed from the support box and turned upside down to expose the underside of the egg form. 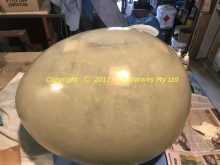 This is cleaned up, PVA mould release applied and the second half is coated with fibreglass as described in previous mould making posts. After polishing the inside of the mould halves with wax fibreglass casts are taken and trimmed to the flange line around the mould on both halves. To ensure that both halves of the egg are joined together securely they need to be fibreglassed along the inside centre seam of the egg. 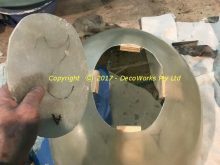 To do this an access panel is cut in one half that is big enough to get your hand inside the egg shell. Blocks of wood are attached to the inside of the shell around where the access panel will be cut. 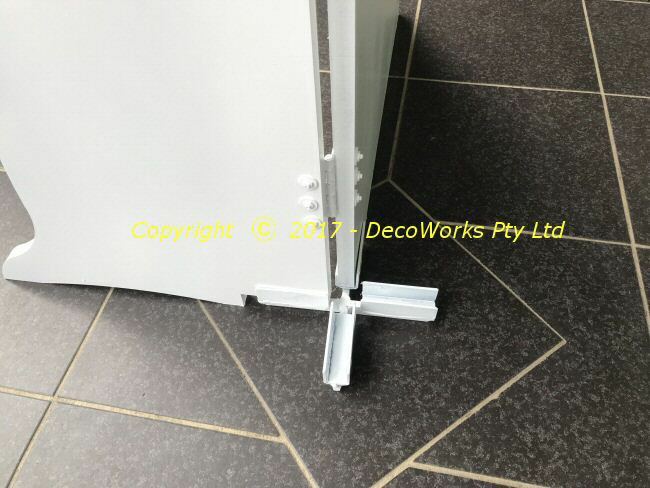 This allows for easy re-installation of the panel section after the work has been done. You can see the alignment blocks in the photo below with the access panel removed. 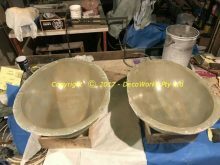 The two halves are taped together with mylar tape to keep them aligned. 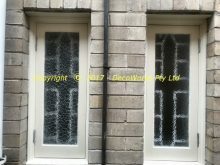 They are then fibreglassed on the inside along the centre seam. 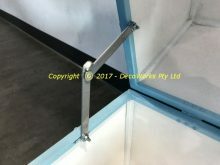 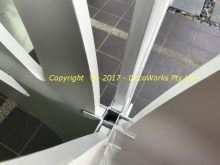 Once this has been done the access panel can be glued back into position and all gaps around the panel opening and the centre egg seam can be filled with polyester filler. 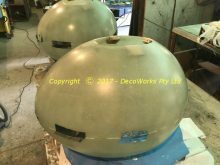 After sanding smooth the fibreglass is given a primer coat of de-waxed shellac. 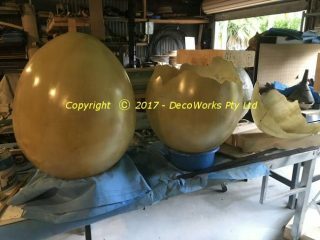 The completed eggs can be seen in this post. 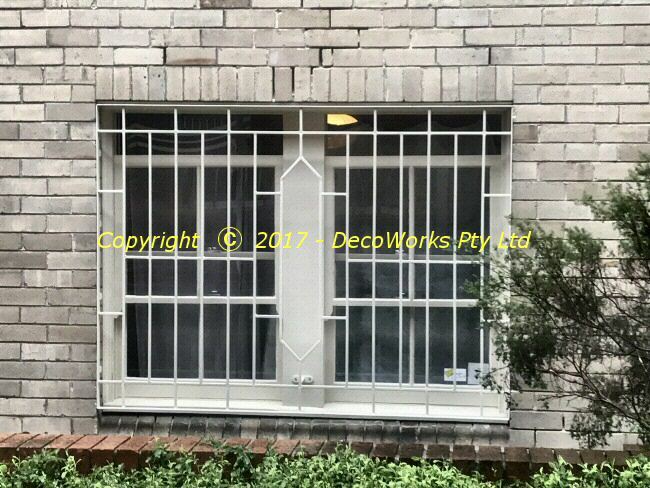 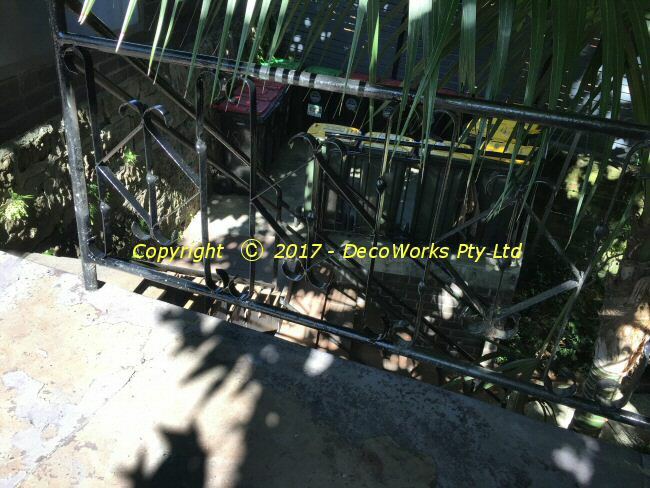 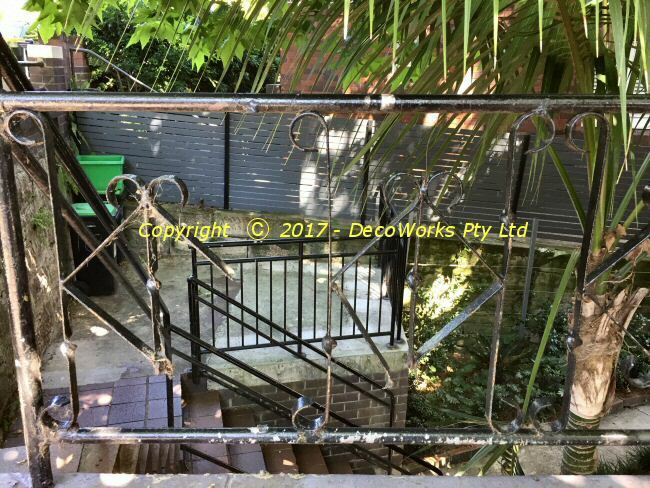 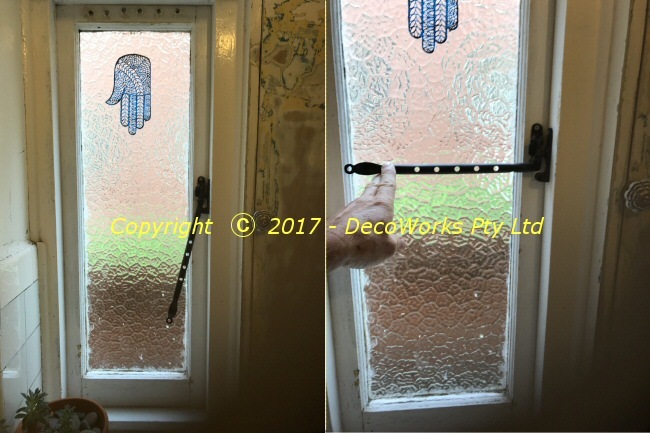 Here is a basic window security bars installation on the lounge room window of a ground floor strata unit. 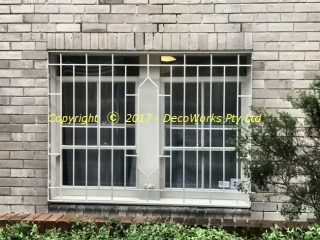 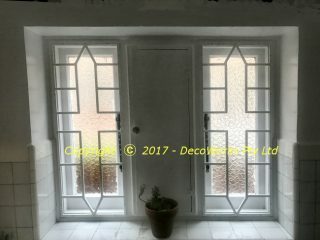 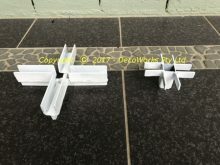 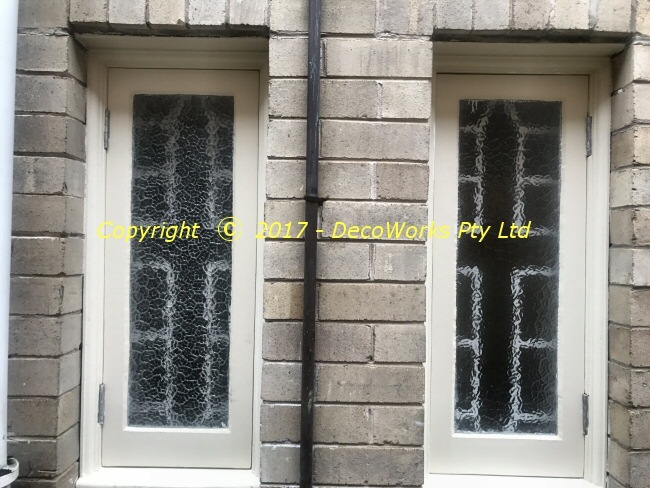 The client wanted something basic but neat so the design was based on the pair of interior bathroom window bars which were also provided for the unit.